Oh, What a Night! — Enliven Production Group, Inc.
On May 18th, Enliven Production Group hosted Arizona Technology Council’s (AZTC) “after5 Tech Mixer,” their monthly networking event. AZTC is a trade association working to make Arizona the fastest growing technology hub in the nation. The Council’s goal is to connect, inspire and empower Arizona’s technology community. One of the ways they do this is with their monthly after5 Tech Mixer. Here the Council teams up with one of its members to bring technology and business professionals together for a productive evening of networking. Enliven was a perfect partner for this month’s mixer. 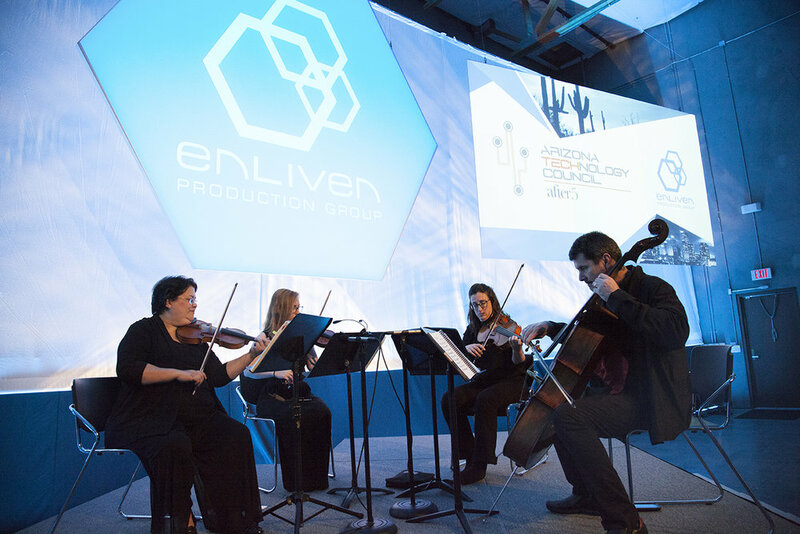 As a professional event design and production company, Enliven understands that a monthly networking event can have a uninspiring vibe when not planned properly. Since Enliven is an expert at designing and executing outstanding events, we spared no expense to ensure the mixer would be an event to remember. The evening began with a ribbon cutting ceremony to celebrate Enliven’s new warehouse and office space. The ceremony was complete with oversized scissors, a beautiful white ribbon printed with Enliven’s logo, and Moët & Chandon Champagne for everyone. The networking portion of the event was held in Enliven’s warehouse. The team set up the mixer as they would a large corporate event. There was a diamond-shaped stage, a colorfully lit backdrop that spanned from wall-to-wall, large floating projection screens including a custom hexagon shaped center screen (a nod toward Enliven’s brand), and an assortment of supporting audio-visual and lighting equipment. 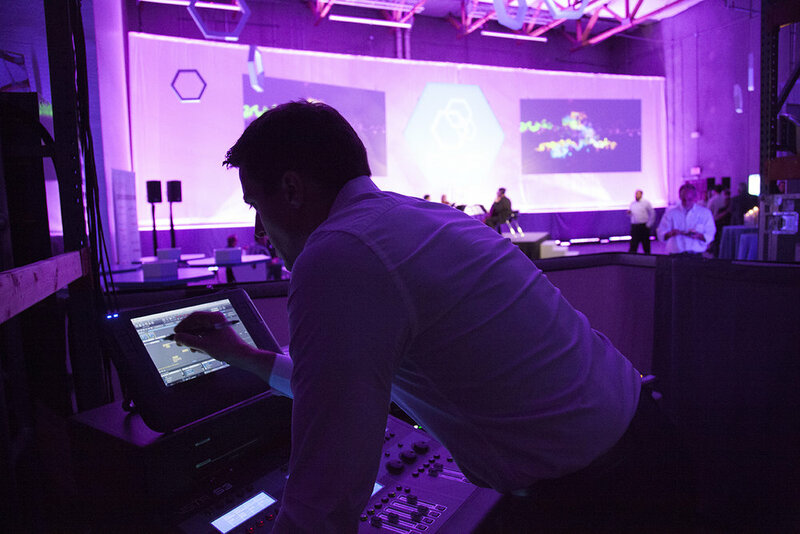 Attendees who looked up did not notice the technical details as much as they noticed large hanging hexagon shapes throughout the warehouse – lit up with special lighting. 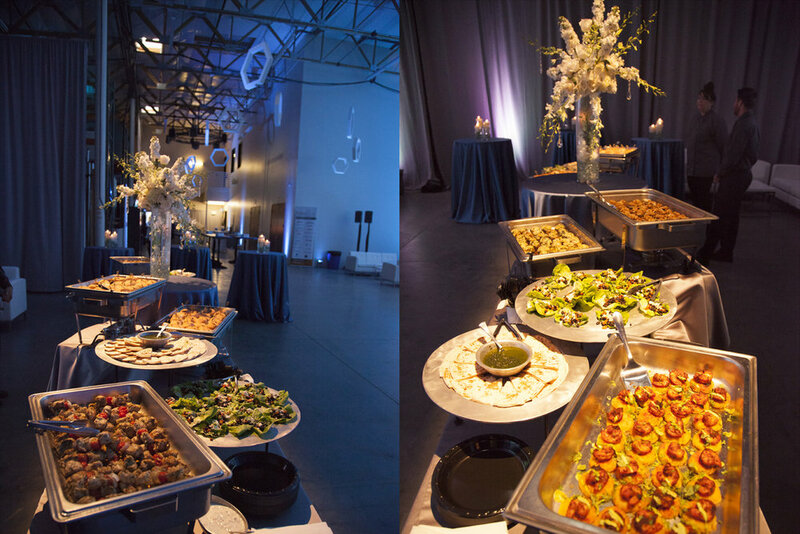 Guests noshed on professionally catered gourmet appetizers and desserts on several differently themed groups of high-top tables, and lounged in groupings of comfortable leather chairs located throughout the warehouse. Acoustic background music was provided by the Four Seasons String Quartet. Their masterful talent and perfect mix of classical and pop music brought a level of elegance to the evening. 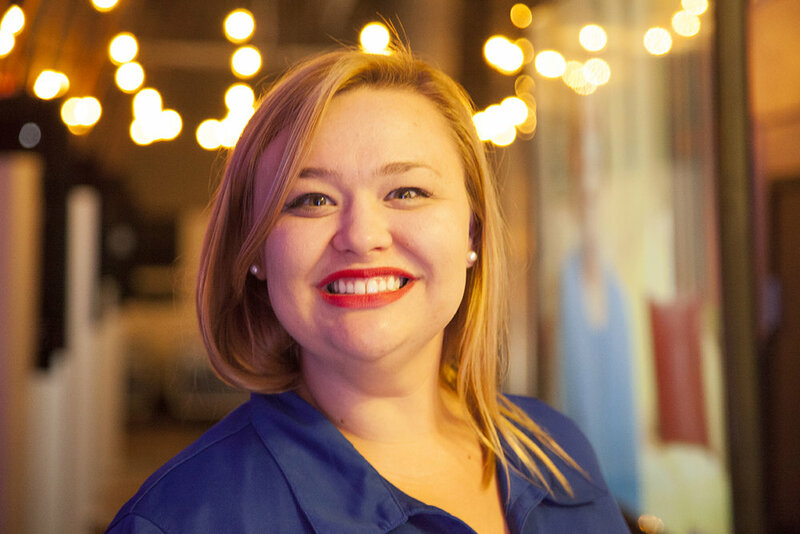 In addition to mingling, attendees were invited to learn about Enliven’s custom Mobile Event App designed to engage attendees, provide real-time information, and help make navigating all facets of any event more friendly. Attendees donated to the heart-warming non-profit group and raised over $400 in addition to Enliven’s $1,000 donation. Enliven looks forward to supporting the foundation again in the future. Click here to see more images of the event and follow us on Instagram. 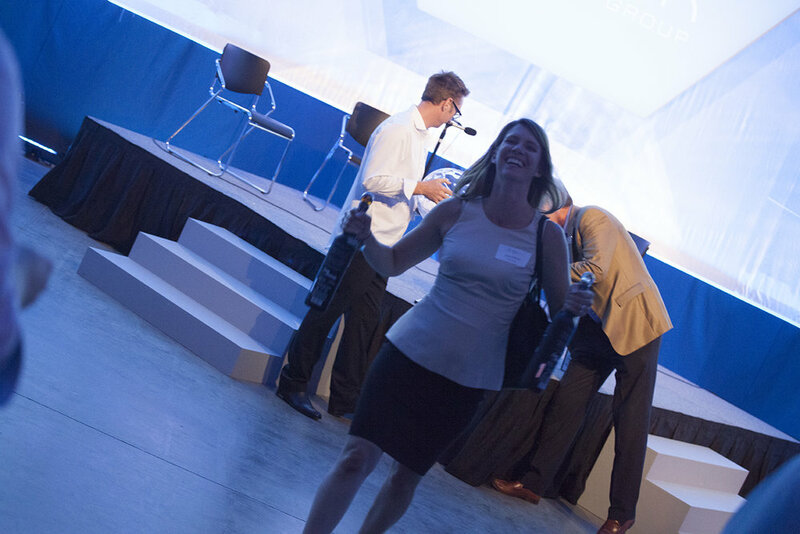 Enliven wants to thank AZTC, its members, and all the companies that attended this night. The council does a fantastic job of bringing those in the tech industry together with non-tech professional services in a way that serves them both. It was the first event that we’ve ever held in our own facility, and we were glad to share it with our friends.